Get a tight new collar and an updated tag with easy-to-read name and number. Get vet records so that you can transfer them to your pet’s new doc. Take your time packing. Cramming everything into boxes the night before a move will stress your pet AND you! Medication and a first aid kit need to be just as easily accessible on the road as food, toys, etc. Keep the pet in a crate. S/he may not be stoked about the close quarters, but it’s safer and simpler for everyone. Start your new routine (such as morning walks, meal time, etc.) right away so pet can feel comfortable in new place quickly. Before unpacking your own stuff, lay out pet essentials so that s/he has some familiar items in the strange new house. Less than a fraction of a percent of pets who relocate by air have accidents. You can feel safe loading Starsky on that plane. 62% of pets travel 50+ miles every year anyway, so moving for them is no big deal. 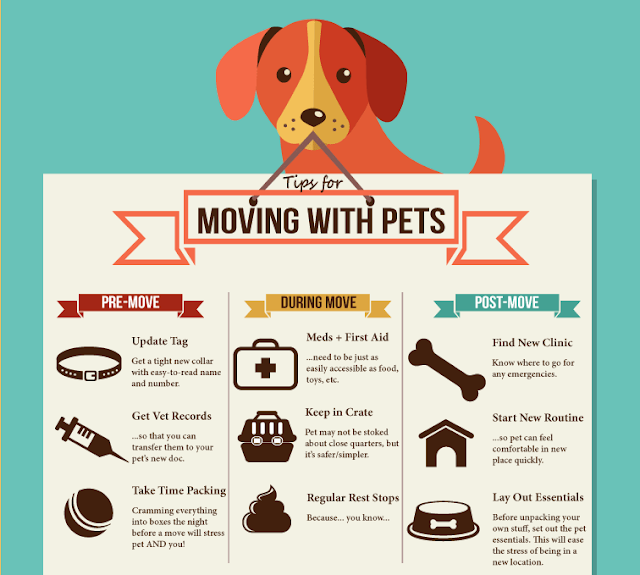 80% of pet owners said that animal safety is their top priority in the move. 61% of pet owners spent less than $500 to move their pet, including costs of pet-friendly airlines, hotels, etc. 11% spent between $501 and $1,000. 28% spent over a thousand on their animal moving expenses. Travel difficulties with pets fit into a few main categories. 32% of movers had a hard time finding pet-friendly airlines. 28% struggled to find pet-friendly hotels. 26% were just caught off guard by how expensive it is to move a pet. 14% simply lacked information on safe pet traveling. 47% of American households have one or more dogs. 46 % of American households have one or more cats. Let us know what tips you have for moving with your pet! This topic was researched using many great resources. Special thanks to Bill Gassett, Realtor Magazine, the Humane Society, andGoPetFriendly Blog.